Once again the Reckless has selflessly went and gone and had a great time at the annual Let's Get Pished and Stoned fest they call T in the Park. This year we can triumphantly declare that The Hives were without doubt the best thing since....well anything. They blew us away with a show only Green Day came close to topping. Oh, and also honourable mentions to Mull Historical Society and Portugese punks, The Parkinsons, who also made us rock and laugh heartily. Oh yes. The Chemical Brothers were shite in a bath. For full picture coverage click here. 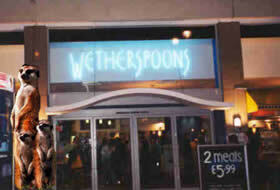 Pub chain Wetherspoons have taken on giant Meerkats to guard their premises due to a shortage of human type bouncers. Tenants affected by the recent flooding have been warned that it's not only the loan sharks who are after them. The Reckless's very own virtual newsreader, Snick Gifford,has been offered a handsome two figure sum to appear in a They Might Be Giants video for Where Do They Make Balloons?